~The SACNS News Service: The DNA of YOUR child in the Womb, can be deducted from Parental DNA, to discover defects! New procedure creates controversy! The DNA of YOUR child in the Womb, can be deducted from Parental DNA, to discover defects! New procedure creates controversy! 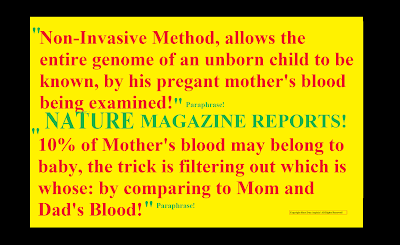 A New Method Screens Pregnant Mother's Blood, for her child's DNA, to screen for ANY 'defects' differences from the norm! Nature Magazine notes, this could cause further dilemmas. Children are often aborted simply for being girls, not boys, knowing the whole genome of the child in a non-invasive method could be disastrous!